I polarise in order to play, stabilizing illusion. I seal the process of magic, with the lunar tone of challenge. Today’s G-Force is Kin 33: 7 Skywalker. Kin 41 ‘Frequency of God’ codes the Antipode/Challenge and Crystal DOG is oUR Hidden Power. PSI = 3 Serpent, [Stephanie’s Signature], and the LC = 6 Night [TMQ’s Hidden Power]. This is the second day of White DOG:GOD Wavespell 14: Power of Heart, and the 22nd day of the Galactic DOG Moon. Seal 10 denotes Love, Compassion and Divine Loyalty. Galactic 22: Noosphere is the mind space of inner time that stretches infinitely into the galactic future. 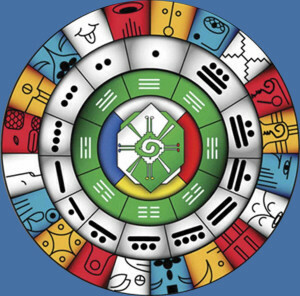 We have a few indications that the qualities of Lunar MonKEY and GALACTIC Dali 22 [CROWN Chakra] ‘flavor‘ the last Hunab Ku Day of the Thirteen Baktuns. Our NoosphericPhone call via Skype begins at 2300 [11 PM] NZT [Night Bio-region]. At that hour, we will all [except Hawaii] be within the Hunab Ku Portal. For Kin in the Sun bio-region [Europe], it will be 11 AM. It will be 7 AM in Argentina and 5 AM in the Eagle region [US East Coast] Those in the MonKEY region have the most challenging time: 2 AM on Wednesday, Hunab Ku Day. To join us, send your Skype ID to TMQ at galactic13@gmail.com, or ‘dial my Skype:’ mysteryqueen2013. Of course, you can also telepathically tune in. These graphics depict a simple understanding of Grayham 13 Eagle’s description of the Cube that ‘incubates‘. The middle image [compliments S’ace 9 Wind] show Birth [from the Cube or encapsulating placenta] and the removing of the veil. Then, we are free to unfold and expand via the PHI Spiral. Transunit 13 struck a chord when he brought up the subject of Caves. Various calendars- or discussions of them-have been appearing all week, including at the Wingmakers site. Branch 4 Sun wonders how I’ll incorporate Hunab Ku Day into my revised, more harmonic 13 Moon Calendar. Hunab Hu Day, which currently is not assigned a kin is providing more incentive to complete this project ASAP. Because this ‘Holiday from the Calendar’ begins in an hour, further discussion will wait for a future post, or oUR Hunab Ku conference call. Now, it’s time to focus on Hunab Ku Day, which Valum Votan compares to the Day-out-of-Time/Galactic Freedom Day. This is a great day for meditation and telepathic connection. Occurring during the Galactic Dog Moon and the Wavespell coded by Dog:God, this Hunab Ku Day is an optimal time to connect with the Divine. The time is now 11:11 p.m. ! This video of crop circles beautifully demonstrates how the Star People are encouraging us to significantly alter oUR DNA. It also mentions PHI ratios, Platonic solids, and more. Today, let’s be Thankful for the Star People, connecting with them as well as the DIVINE [called the Ineffable by Les Visible :)] Now, I’m closing down the electronic interference [wireless internet, etc; Thanks Pedrin 4 Warrior.] to meditate and telepathically connect, through the middle of this special day 🙂 Also happily anticipating the technological connection with some of you during the 23rd hour [NZT] of Hunab Ku O.O. Just after those words were written, Melovia 129 phoned. Our conversation was shortened by my desire to post this addendum. Five seconds after we hung up, the phone rang: It was Kim, whose Kin and name [11+9+13 = 33] equal today’s G-Force: 13.7, Resonant Skywalker. 13.7 + my Kin: 18.8 equals 11.2, 2 MonKEY! Now, after reading the 6 comments that arrived during these two calls, TMQ will telepathically engage with YOU, the Star People, HUNAB KU and the Divine. I harmonize in order to target, modeling awareness. I seal the input of flowering, with the galactic tone of integrity. The Analog: 15.8 reflects today’s 13 Moon date: 8.15, here in the Southern Hemisphere, while the Antipode, 14.8 mirrors the current 13 Moon date,in the Antipodal Northern Hemisphere. The G-Force of 8 Seed is Kin 38: 12 Mirror. Guide Galactic Star is oUR Guiding Star for oUR 2013 Galactic Synchronization. The CDK is also a Star: Solar Star. The Long Count Kin is 12 Warrior. Today’s Hidden Power is 6 Earth. The PSI for Galactic 15 is Magnetic Earth, which codes this 13th Wavespell, and denotes Synchronicity. Happy Galactic Return to James 8 Seed 🙂 Self-Existing Sun [4 days ago] was the Galactic Birthday of branch, Lore, and Jesus Christ. Wavespell 13; Day 8: Two Galactic Spins plus one Hunab Ku Day, remain until oUR GALACTIC SYNCHRONIZATION in 2013. This article describes how Stonehenge, beyond highlighting the Solstice, was important for it’s Sound effects. Many believe that sound [vibration] was the method by which Stonehenge and the Pyramids were built. and Marko Rodin” Confusius once said: “If one should desire to know whether a kingdom [or Queendom] is well-governed, if its morals are good or bad, the quality of their music will furnish the answer“. The ‘quality of music’ is referring to the frequency, and mathematical intervals.After the post for Kin 157 was posted, Grayham 13 Eagle [privately] pointed out that Melchizedek’s Merkaba does not conform to Phi principles; 432 is not a Fibonacci number… But the importance of frequency is well-demonstrated in this video. Kin 13‘s poetic and prolific contributions caused a record number of comments. [78 [sum of the tones of the 13 Pacal Votan Clear Signs 🙂 at this moment] Thanks to all of you! 93 continues: “Awake To RANG. Sacred Sounds of Harmonic Convergence. died at age 48 [=Electric Star] on Moon 8: Day 5. 8.5 equals Overtone Star. This video [taken from CHC: Book of the Transcendence; Chapter 2] holds critical clues for our 2013 Galactic Seed Galactic Synchronization. As the final words of this blog are written, it is February 22nd [GAP 9 Serpent], the one year anniversary of the most devastating [of thousands of earthquakes endured here] Christchurch earthquake, which happened on PVCS Galactic Sun. One week and one year after this pivotal and ongoing tragedy, we observe the last Hunab Ku Day of the 13 Baktuns of History. Following this Hunab Ku Day, the correspondence between the daily plasma and the day of the week will shift again. Galactic Seli 16 falls on Wednesday, Galactic Seli 23 will be on Thursday. As longtime readers know, these annual [and twice during Leap Years] shifts are something that TMQ is ‘rectifying‘ in the more harmonic Calendar she has developed, for use in 2013. To observe this special ‘Hunab Ku Day’, all Kin are invited to participate in a Skype NoospherePhone call. The light of ‘Quetzalcoatl’ 1987A reached Earth on Feb. 23rd [Kin 101]. It was ‘discovered’ on Feb. 24th [2.12], independently, by astronomers in Chile and New Zealand. These two countries are linked by this Galactic discovery, and by two twin tragedies. Concepcion Chile had an 8.8 Earthquake on 2/27/2010, 23 years and 3 days after ‘they’ discovered 1987A. ; and 12 Moons and 23 days before Christchurch’s Galactic Sun Earthquake. So, our ‘test Noospherephonecall’ [TMQ has only Skyped once–with S’ace 9 Wind} will connect the Earth‘s two Hemispheres via Quetzalcoatl 1987A, 8.8: oUR Guide today and for Galactic Synchronization 2013, and Jesus Christ, the Messenger of U.R. ; Universal Religion, Universal Recollection. Details for oUR Noospherephonecall on Hunab Ku Day will be in the next transmission. All [with or without Skype capability] are invited to participate telepathically, and by sending in the topics you would like to see explored on the daywhen we are most connected with Hunab Ku, One Giver of Time and Measure. I unify in order to evolve, attracting synchronicity. I seal the matrix of navigation with the magnetic tone of purpose. Today, in the Dreamspell, we enter the Yellow Southern Castle of Giving, and Red Earth Wavespell 13. We also begin Week 30, which corresponds to Codon 60: MEASURING: Galactic Octave Limits Space. 30 and 60 are Pacal Votan Clear Signs, and synchronistically, Galactic Octave numerically translates to 8, 8; today’s 13 Moon date of 8.8. “After 30 [PVCS]years spent drilling through a four-kilometer-thick ice crust” the “Team of the 57th [PVCS] expedition to Vostok Antarctic research station” “heroically raised 40 [PVCS] litres of ‘pre-historic’ water from a 20 [PVCS] million year old lake. “Scientists are set to reveal its 20-million-year-old secrets, and initiate a quest to discover ET life.” “The Vostok project breathes an air of mystery and operates at the frontiers of human knowledge. The lake is one of the major discoveries in modern geography; drilling operations at such depths are unprecedented; never before has a geological project required such subtle technologies.” “Lake Vostok is a unique closed ecosystem . Lake Vostok Water [alpha-numerically equals 208] is a most precious, pure and unique substance of our Earth. The day AFTER December 21, 2012 [208, Cosmic Star] BEGINS the “Time of Never Ending Peace“. I have been told that what we are experiencing here on Earth has actually been a Grand Experiment. I was asked to share this with the world. The entire universe has been watching to see if we were going to be able to pull off this Ascension process. The Hopi call it the Fifth World. The Tibetans call it Shambala. Every culture has a name for it. I was told that this experiment has been tried many times in the universe and failed. The planets ended up not learning compassion and cooperation and destroyed themselves. In this video, Melchizedek 144 also discusses Comet Holmes and the Waitaha. Until now, TMQ was aware of no one else who felt the significance of that event [the Comet brightened by a million times in a 24 hour period: 10/24/2007 -coded by 144! ], during the week that TMQ, Valum Votan and Stephanie South met with and were adopted by the Waitaha; People of Peace. TMQ wrote about it here: http://www.planetartnetwork.info/pan_reports/lunar_wizard_reports/moon13/newzealand13.html “This unprecedented brightening is the largest known outburst by a comet, and by November 9th, it was the largest (with a diameter 7 times that of our Sun!) object in our Solar system. Comet 17P Holmes caused great excitement among astronomers, scientists and various religious traditions, but was ignored by the Mainstream Media”. Melchizedek calls Planet Holmes the biggest event in our Solar System. On this day that is coded by Seal 17: EARTH: SYNCHRONICITY, the NUMBERS [The Language of Telepathy] contain some special and unique synchronicities. Raven Walker’s most recent comment feels appropriate for closing this Valentine’s Day transmission on the first day of Wavespell 13. I harmonize in order to play, modeling illusion. I seal the process of magic with the galactic tone of integrity. Today’s G-Force is Crystal Serpent, and the Long Count Kin is Crystal Night. 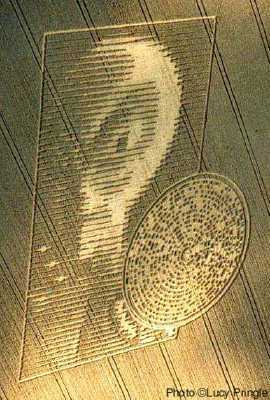 This crop circle features 28 RAYS. The 28th comment on Kin 146 is synchronistic: Yesterday, TMQ wrote in her first draft of this blog, that Kin 151‘s Antipode, Kin 21 [her Analog and VV’s G-Force] reminds us that we are 21 days away from Hunab Ku Day [a.k.a. Feb. 29th, Leap Day]. The Codon for Week/Heptad 29: 5: “PEOPLE TOGETHER: Tree Evolves Space“, reinforces that idea. “People Together” reminds one of “Anonymous” http://www.youtube.com/watch?v=RxYOOnFSijg&feature=related and the ‘amazing consciousness shift’ in which we are engaged. 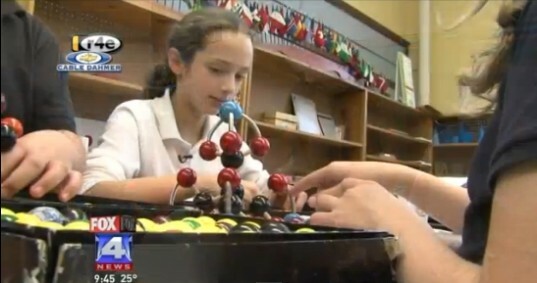 http://inhabitat.com/10-year-old-girl-discovers-new-molecule-that-could-help-energy-storage/ discovered a new molecule! TMQ believes that the 7th Moon of each year is analogous to the 7 Mystic Moons which are between the end of the Great Cycle of Becoming on the 2012 Solstice, and oUR 2013 Galactic Synchronization which begins oUR Return to Source, the Original Matrix Attained. This Galactic Moon could be viewed as an annual fractal of the Galactic Seed year which inaugurates oUR Return. The Dawn of the Galactic Seed Galactic Synchronization is 19 Moons from today. Today is the 39th day of 2012. The first communication received from Valum Votan after he and Stephanie 185 moved from Nelson was an unsigned article called “2012 Landings“. 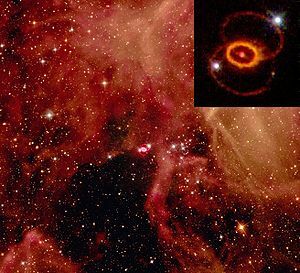 Galactic is derived from Galaxy. I activate in order to equalize, bonding opportunity. I seal the store of death with the electric tone of service. The G-Force of 3 World-Bridger is 10 Sun, and the CDK is 3 Moon. Today’s Long Count, 7 Mirror, is a Magic Turtle. Today’s 13 Moon date: 7.25 date reminds us of the Day-out-of-Time/Galactic Freedom Day, observed on Greg. 7/25. Those numbers are also a coded reference to the Sacred Ratio of 5 to 7: 5 Solar Spins to every 7 Galactic Spins. Valum Votan’s ascension on Kin 88: Planetary Star [Northern Hemisphere] illustrates this ratio. He departed 7 spins after our meeting in Sedona on Kin 88, which was on March 27, 2006 [the Galactic Return of my Kin 88 year]. That 13 Moon date of Solar 21 is 4 days after Solar 17, but when we add in the 5 intervening Galactic Freedom Days and the 2008 Hunab Ku Day, we see that the Solar Spin is only two days off from a perfect 5 to 7 Ratio. This morning, at 7 a.m. on the 25th day of the 7th central Moon, coded by Kin 189: Resonant Moon, the center of New Zealand experienced a 5.7 earthquake, which lasted ten seconds. Although it emanated from 200 kms. [Kin 200 is the 7th Solar Witness] below the surface, it was widely felt in this area, and in the bottom part of the North Island. Let’s take this as a signal to delve deep during these ten G.A.P.s. We know that this energy release from our Earth’s core was followed [70 days later] by the most powerful Solar Storm in 7 years, on Valum Votan’s Solar birthday. 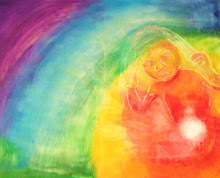 That was a potent reminder of the need to raise oUR vibration. This video by Melchizedek 144 http://www.youtube.com/watch?v=7irynJtKI4I beautifully illustrates how “We can raise our vibration and walk into the higher realms of light’. Three days remain in this 7th Moon [coded by Kin 187: 7 Moon] when we ask “How Can I attune my Service to Others“. During ‘his Moon’, Jannis 7 Moon attuned his service, in the form of diligence and computer skills [at identifying the code that was causing problems] to restoring this blog. TMQ is so grateful and relieved! Each of your comments lifted my spirits and made such a difference during this frustrating time 🙂 Now that WordPress is ‘allowing‘ me to access my blog, responding will be easier.